iPack Builder v2 is the successor of the iPack Builder version 1. Version 1 was simple and didn’t allowed much more options,but that gave me an idea to develop much more advanced version and result is this. If you have made iPack with any older version ( current version is 2.2) , instead of remaking your iPack with new iPack builder, just upgrade your iPack. With this tool you can make icon pack installers in exe format. The installer will work perfectly on Windows 7, 8, 8.1, 10 both x86 and x64. The idea was simple enough that we wanted to patch windows dll’s exe and other things without messing around.The existing solutions were in stable and took a great amount of time. You don’t need any other software to install the pack. 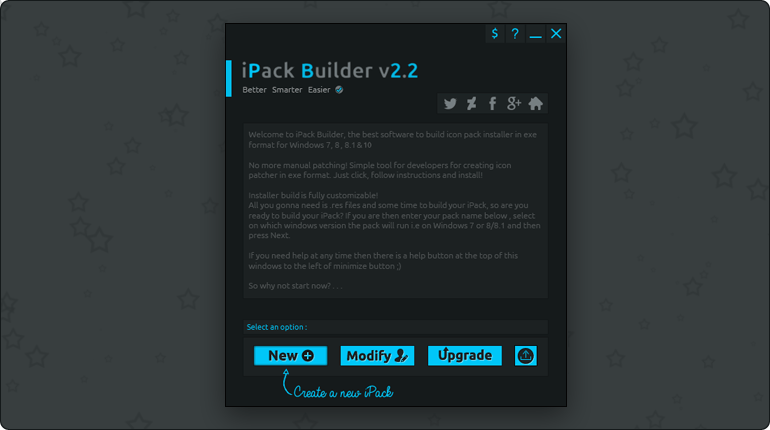 Simple interface, just click on buttons and install the pack. Packs built with iPack Builder and for 7tsp are nearly of same size. iPacks are smart enough to check if x64 windows, if found x64 windows then it will patch both x86 and x64 dll files. The previous version could only patch limited predefined files but this will look up for file, if found then only patch it! This version saves ACL files. Pack’s built with this version are smaller. Submit your iPack to us!